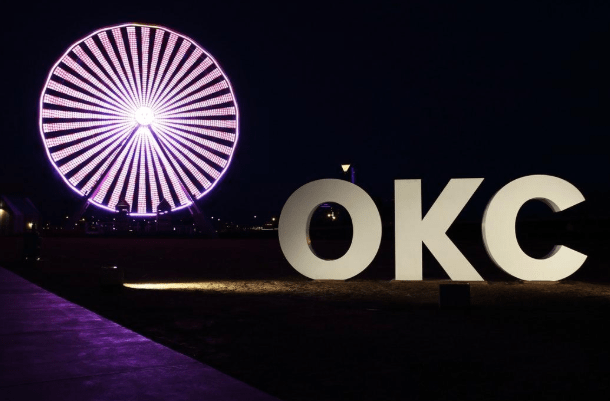 Oklahoma City, Oklahoma is a Midwestern city that can be a blast for visitors. Options in things to explore in the energetic metropolis are plentiful as can be. Visitors can savor cultural attractions, amazing dining options, soothing parks and so much more. If you’re going to be traveling to Oklahoma City or to Bricktown specifically, don’t plan on being bored even for a millisecond. Bricktown, in brief, is an entertainment staple in the area. It’s chock-full of fashionable boutiques, serene lounges and mouthwatering eateries galore. If you have a penchant for fascinating animals, then a trip to the Oklahoma City Zoo may be in order for you. People who head to this zoo can feast their eyes on 1,900 types of creatures. They can stroll through tranquil and magnificent botanical gardens as well. Oklahoma City makes a superb destination for families and for individuals of all age groups. Frontier City Theme Park is a terrific spot for people who are in the mood for unadulterated joy. It’s been in existence since the late fifties and is ideal for fans of energizing roller coasters, games and irresistible snacks. Standout rides at Frontier City Theme Park include the roller coaster Steel Lasso, the Grand Centennial Ferris wheel and the Grand Carousel. People who love learning may want to check out the intriguing Oklahoma City Museum of Art. This museum puts a wide range of enthralling exhibitions on display for the world. It makes a superb spot for people who want to discover European and American art pieces. If you’re interested in educational places that can be suitable for all members of the family regardless of age, this museum should be a high priority for you. Eating well in Oklahoma City can be a cinch. There are so many restaurants that specialize in delicious foods of all kinds. If you’re craving All-American food delights, you can head to the Bricktown Brewery. The establishment’s sizable menu includes everything from spicy chicken sandwiches and barbecue chicken pizzas to meatloaf sandwiches and chicken tenders. Italian food lovers in Oklahoma City can head to Zio’s Italian Kitchen. This spot has a laidback vibe and is optimal for people who want to chow down on traditional options from Italy. It’s optimal for folks who love to nosh on authentic brick oven pizzas of all kinds as well. If you’re searching for a place to rest your head in Oklahoma City, you should have zero issues. You can reserve a room at the Hyatt Place Oklahoma City/Bricktown. This beloved spot is close to the Cox Convention Center, the Chesapeake Energy Arena, Oklahoma City University and vibrant Bricktown. There are 134 guest rooms in total at this hotel. They include a number of highlights such as sofa sleepers, work desks, small refrigerators, flat screen televisions, alarm clocks, microwave ovens and irons. Visit their page to see just how close they are to all of the excitement in this town. 21C Museum Hotel makes a wondrous hotel option for people who adore sleek and streamlined spaces. It makes a fine hotel choice for people who are deeply fond of the art world as well. The rooms at the hotel have amenities like coffeemakers, flat screen televisions, alarm clocks and complimentary wireless high-speed Internet access.